Matthew Askari April 10, 2019 Comment Now! Pulling out of the 123-story Lotte World Tower into the crush of Seoul’s morning traffic in the 2020 Hyundai Sonata, the striking symbolism isn’t lost on me. The 1,819-foot tower is new, the fifth-tallest building in the world, and the tallest in Korea. 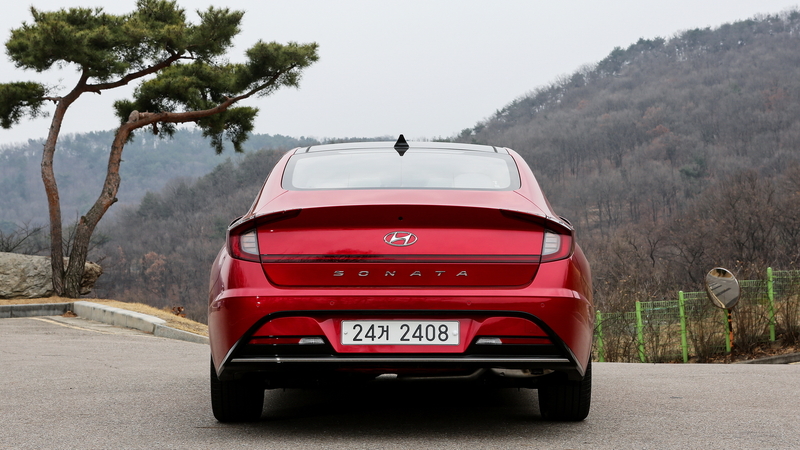 This engineering marvel symbolizes the dramatic progress Korea has made in a short time just as the eighth-generation Sonata that will land in the U.S. later this year represents the dramatic leap Korea’s largest automaker has made in the automotive industry. The 2020 Sonata isn’t just a good Korean car, it’ll tango with the best of the mid-size segment. It has a few strong cards to play to make it competitive. First, and most noticeably, is the styling. It’s stunning, and photos don’t quite capture the presence the Sonata has in person. But it’s also more dynamic, and it will feature a range of engines to satisfy a variety of buyers. Slow-rolling out of Seoul in the crush of traffic, I’m in a Korean-spec car fitted with a sleepy 2.0-liter inline-4, paired to a 6-speed automatic transmission. The engine makes 158 horsepower and 145 pound-feet of torque. The powertrain suffers from a noticeable lag between when I press the accelerator and when the engine actually starts to deliver power, generally about two seconds later. Thankfully, the U.S. will get a host of more powerful, and likely more responsive, engines. A 2.5-liter naturally aspirated inline-4 will serve as the base engine, good for 191 horsepower and 181 pound-feet of torque, while a 1.6-liter turbo-4 will be the ever-so-slightly upmarket play. That engine boasts similar power figures, at 180 hp, and 195 lb-ft of torque. A more-powerful 2.5-liter turbo-4 will eventually come. Albert Biermann, head of R&D for Hyundai (and former head of BMW M) says while he can’t elaborate, we can expect a significant power bump to come to Sonata soon. Not coincidentally, he also mentions that Hyundai will expand its N lineup, especially in the N-line, which is more of a trim. Expect a Sonata N-line with the 2.5-liter turbo-4 to follow, likely in 2021. While the Korean-market powertrain would be wholly insufficient in the U.S., thankfully I get a little time with the 1.6 turbo-4 on Hyundai’s Namyang high-speed test track. The track is short, but it’s a good test for the Sonata’s new platform. It features several corners that are great for evaluating dynamics, its elevation changes will work the engine and transmission, and its long straight will let me get well past highway speeds and give the brakes a good test to boot. 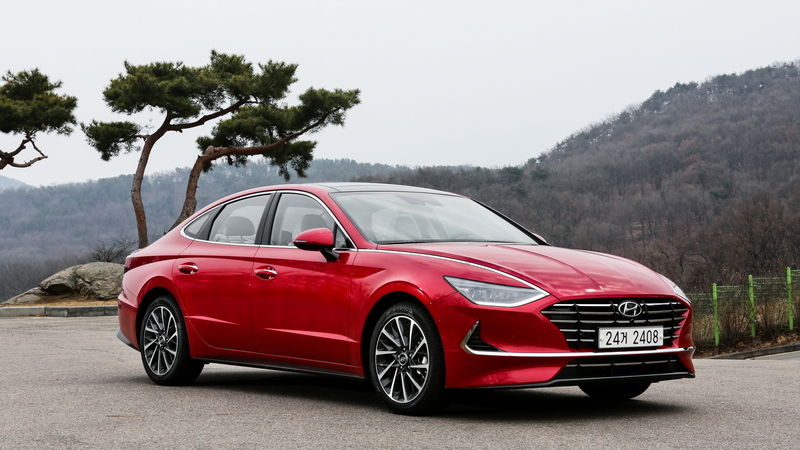 The 2020 Hyundai Sonata is built on a new, third-generation platform that will be used by several future Hyundai and Kia car and crossover SUV models. Codenamed “N3” internally, the architecture makes strategic use of high-strength steel to make it lighter and safer, and to improve driving performance. The front-drive platform can facilitate all-wheel drive, which will not be offered for the Sonata at launch, but Hyundai’s product planners say it’s something they are considering. The Sonata I’m driving on the track is paired to an 8-speed automatic transmission, the same setup we’ll get in America. Acceleration from the 1.6 turbo-4 feels pleasingly quick, and the 8-speed auto—motivated by boost and more power to call upon—does a good job of channeling that power. In automatic, while not seamless, shifts occur quickly and smoothly. I took a second lap, this time opting for the paddles, second into third for the short corners, up into fifth and sixth before coming down hard on the left pedal. While the engine lacks a sporty engine note, I assume the N-line engine will handle those duties. Turning into the short corners, the car remains planted even as the tires squeal. While it exhibits noticeable weight shift and body roll, they’re both less than you’d expect on a mid-size sedan. I momentarily crest triple-digit speeds on the straightway on my second go before slamming on the brakes. The braking is excellent. The engineer riding with me swears the car doesn’t have Brembos or a special track setup, and I confirm he’s not pulling one over on me with a peek at the brakes after my run. The brakes may be stock, but I do notice that the car is wearing Continental summer rubber. U.S. cars will get all-season tires, so they won’t grip as well as this one did. The suspension damping will also change slightly. The Korean market generally prefers softer damping than North America, mostly to deal with a distressing amount of speed bumps. Nonetheless, this car feels about right for what we’ll get in the U.S. The steering is well-weighted—light, as this segment calls for—and consistent. Despite Hyundai’s efforts to improve NVH, road noise and wind noise both make themselves known at highway speeds. They’re not distractingly loud, but they are noticeable at times in the background. As improved as the dynamics may be, the Sonata’s trump card is its design. In a shrinking sedan market, Hyundai went bold and broke new ground with the Sonata’s design. “It was a case of do we go the way of the Big Three, and begin to eliminate and go in an all-SUV direction? 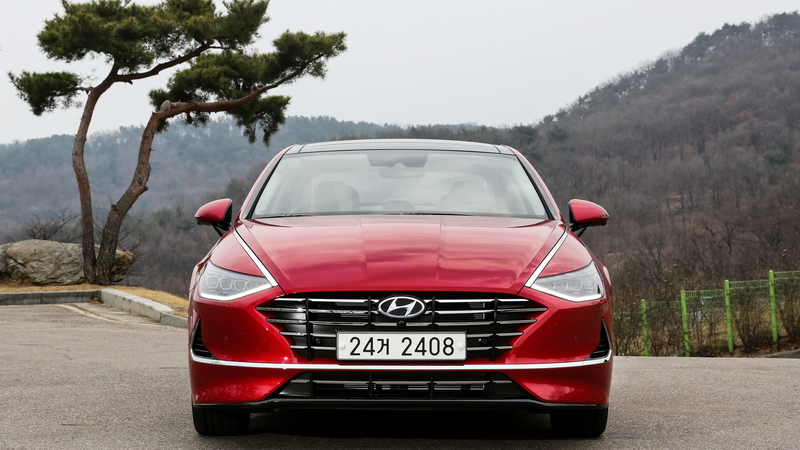 We decided to go a different way, to go bold, we think there will always be a place for the sedan.” SangYup Lee, head of Hyundai design (and a former Bentley and GM designer), tells Motor Authority. The hood is long, and the nose pinches down low, like on an Aston Martin. That’s not a coincidence. "Astons are very expensive cars, and they have a lot of money to work with the sheet metal. But why can’t we bring some of that style to a car in this price range?,” Lee says. The standout design element is the Hidden Lighting Lamp, which employs a chromic strip that looks like it’s part of the chrome strip that runs from the headlight, along the hood, to the door. When the car is on, it illuminates and is an extension of the daytime running lights. It’s especially eye-catching when you see the Sonata in your rear-view mirror. Two character lines draw the eye and break up volume in the profile view, while in the rear aero pins on the taillights add a sporty touch. 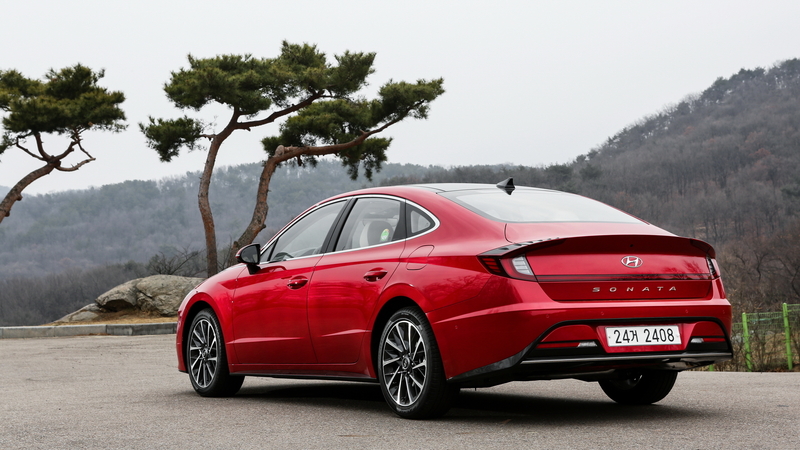 The Sonata looks great to my eye, but it’s also a risky play that’s sure to polarize. While the exterior is bold, the interior is decidedly modern. It’s designed around two screens. One is a curved-display, 12.3-inch touchscreen that is easy to use and controls navigation and infotainment functions. The second is a 10.2-inch digital skin for the instrument cluster. Its graphics and colors change depending on driving mode. Toggle into Sport mode, for example, and a blue splash momentarily overtakes the speedometer and tachometer, as they turn to red. Hyundai also offers a wireless charging pad—though I noticed my phone was on slow-roast after 30 minutes of resting on the charger. The cabin is roomy and luxurious, too. The center stack features tactile knobs for the temperature controls that could have been pinched from a German luxury car; the cushy headliner feels high-end; and piano black, chrome, and faux-leather trim accents complement the overall aesthetic. The available nappa leather-wrapped seats are comfortable, and higher-end models have a striking stitch-quilting pattern on the seats. The back seat has ample knee and leg room, and head room is sufficient for all but the tallest passengers. 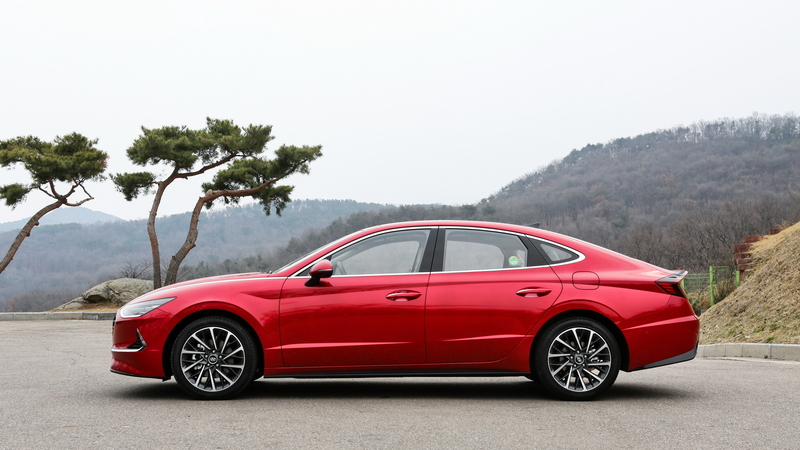 The 2020 Hyundai Sonata boasts striking, elegant styling, and a modern, attractive, and cohesive interior to create a premium vibe usually reserved for pricier cars. Its range of engines will suit varying tastes, and its improved dynamics will satisfy more drivers. Hyundai has come a long way from the value brand of the 1990s, and the 2020 Sonata will be an alluring standout in a shrinking mid-size car segment. Hyundai paid for travel and lodging for this Internet Brand Automotive contributor to bring you this firsthand report.